President of the Hellenic Republic Prokopis Pavlopoulos on Tuesday opened the Concordia Europe Summit in Athens, a platform to exchange ideas so that Europe meets the challenges of the 21st Century through public-private partnerships. “Concordia believes that public-private partnerships (P3s) have great potential for impact in Europe as it works to preserve a modern-day union, calm a burgeoning refugee crisis, and reignite regional economic growth, while remaining on the path to achieving the U.N. Sustainable Development Goals by 2030,” notes the Organization. 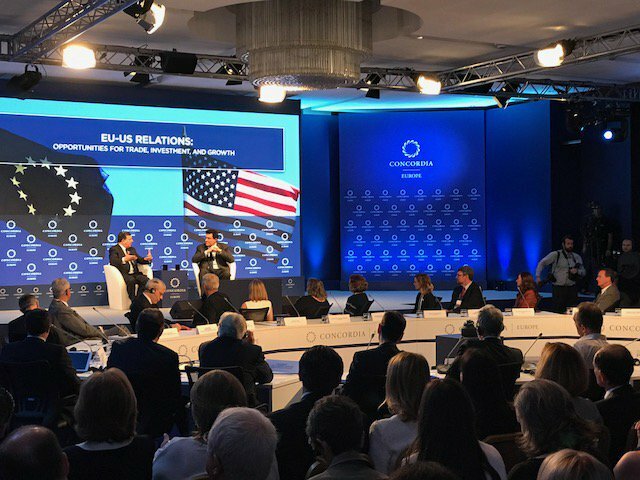 On the first day of the two-day event the issues discussed were: EU-US Relations: Opportunities for Trade, Investment, and Growth. Concordia hosted a fireside chat with former President of the European Commission and former Prime Minister of Portugal, Jose Manuel Barroso, discussing aspects of the economic relationship between the United States and the European Union. Moderator for the talk was Alexis Papahelas, Executive Editor of Greek daily newspaper Kathimerini. The talk that followed and was moderated by Concordia Co-founder Matthew Swift was titled “Building a Culture of Leadership: Realizing the Private Sector’s Impact Potential.” Muhtar Kent, Chairman of The Coca-Cola Company spoke of an organization’s potential for social impact, based on ethos and values cultivated by its leadership. The Summit also focused on “Going Global: Scaling Local Partnerships in Health, Education, and Community Development.” A panel discussion regarding the development of public-private partnerships (P3s) for social impact. In the session, the Athens Partnership in Greece and My Brother’s Keeper Alliance in the United States will be highlighted as case studies of organizations promoting the value of strong cross-sector collaboration, which can spark innovation and help local, national, and global leaders alike to rethink their path to social and economic impact. The speakers for this session were Giorgos Kaminis, Mayor of Athens; Alexandros Kambouroglou, Executive Director of Athens Partnership; Nicholas Logothetis, Concordia Co-Founder & Chairman; David Simas, Chief Executive Officer of Obama Foundation. 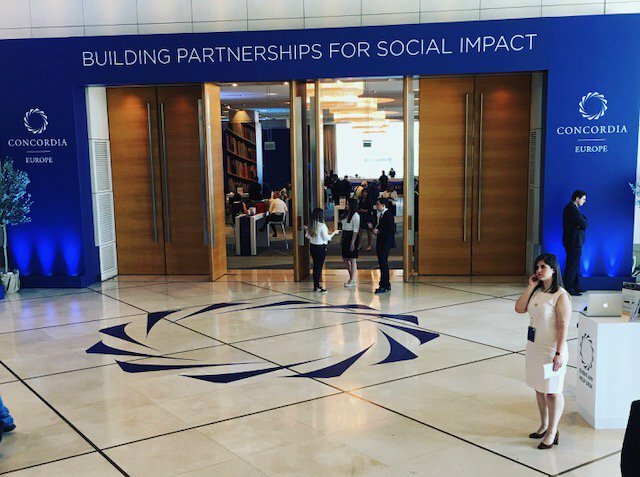 European Action for Sustainability: Investing in Partnerships to Achieve the SDGs, was the last issue discussed on the first day. Speakers participating were Muhtar Kent, Nestor Osorio Londono, Ambassador of Colombia to the United Kingdom; Dimitri Papalexopoulos, Chief Executive Officer of Titan Cement Company SA; Valdis Zatlers, Former President of the Republic of Latvia, Despina Anastasiou, Regional Leader Central Europe &President Dow Hellas, Dow Chemical; Peggy Antonakou, CEO of Microsoft Hellas; David Horner, President of The American College of Greece; Spyros Kouvelis, Senior Expert of Sustainable Development & Circular Economy, UN Environment Programme-MAP; Jean-Yves Le Saux, Director of the Bureau of Strategic Planning of UNESCO; Tim McBride, SVP, Government Relations, United Technologies; Ted Mitchell, Under Secretary, U.S. Department of Education; Eduardo Padron, College President, Miami Dade College; David Simas; Christos Stylianides, Commissioner for Humanitarian Aid and Crisis Management of the European Commission; Kristina Tremonti, Anti-Corruption Analyst, OECD; Nikos Trantas, Head of Unit, General Secretariat of the Government, Greece; Marianna Vardinoyannis, Goodwill Ambassador UNESCO, Marianna Vardinoyannis Foundation; Grigoris Zarifopoulos, Google Country Manager for Greece, Cyprus and Malta. The Concordia Europe Summit in Athens will continue and conclude on Wednesday.